WAX: For standard printing on paper labels, Zebra's wax ribbons are unsurpassed for performance and value. WAX/RESIN: Zebra's wax/resin ribbons are formulated to offer high-quality, durable bar codes, text and graphics. RESIN: For the ultimate in chemical and heat resistance, Zebra's resin ribbons can handle the harshest environments. 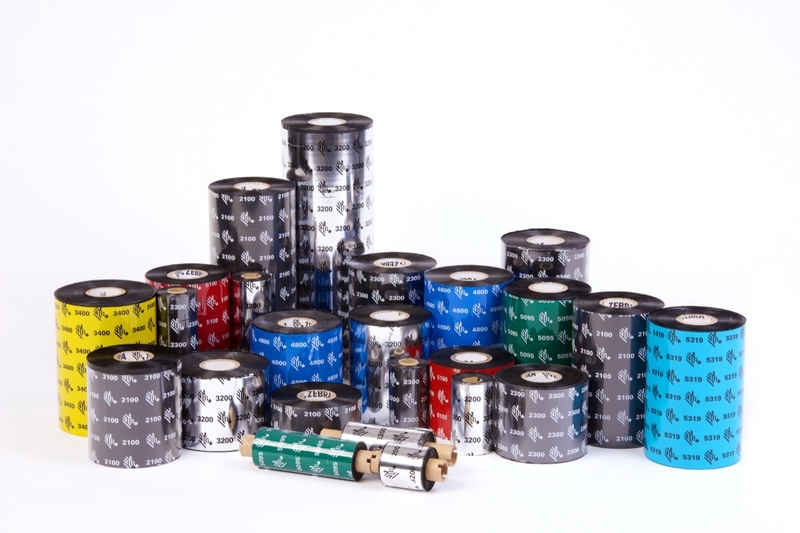 You can be assured that when used together, our ribbons and labels will provide optimal performance with your Zebra printer and extend the life of your printhead. Zebra offers several performance wax ribbons formulated for high-quality printing on both coated and uncoated paper facestocks. Use this standard wax ribbon for printing high-quality bar codes on coated paper and synthetic label stock at speeds up to 12 inches per second. Use this resin-enhanced wax ribbon for high-speed printing. High print quality for normal and rotated bar codes on coated/uncoated labels and tags. Use this wax ribbon for tough-to-print uncoated or uneven tag stocks. Features unmatched scannability and performance, even on Tyvek. Zebra's wax/resin ribbons are formulated to offer high-quality, durable bar codes, text, and graphics on Zebra's coated paper facestocks and synthetic materials. This durable, special ink formulated wax/resin ribbon is UL Recognised and CSA Component Acceptable when used with Zebra approved labels. Use this wax/resin ribbon for printing bar codes on coated paper. Clear images and durability in harsh conditions. Zebra's resin ribbons provide exceptional solvent resistance for the harshest environments. Use this enhanced resin ribbon for dense bar codes and graphics on a wide variety of materials. Excellent edge definition on synthetic substrates. Use this premium resin ribbon for printing dense black images in harsh environments. Great choice for printed circuit board applications.